Marcela Sulak is the author of two poetry collections from Black Lawrence Press, Decency (2015), and Immigrant (2010), and one poetry chapbook, Of all the things that don’t exist, I love you best (Finishing Line Press, 2008). She is the coeditor of Family Resemblance. An Anthology and Exploration of 8 Hybrid Literary Genres (Rose Metal Press, 2015). 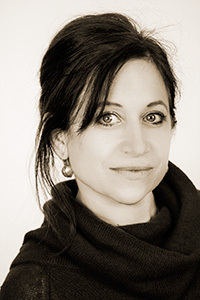 Her four book-length poetry translations from Hebrew, Czech, and French, include Twenty Girls to Envy Me: Selected Poems of Orit Gidali (University of Texas Press, 2016), A Bouquet of Czech Folktales by Karel Jaromir Erben (Twisted Spoon Press, 2012), Bela-Wenda: Voices from the Heart of Africa by Mutombo Nkulu-N’Sengha (Host Publications, 2011), and May by Karel Hynek Mácha (Twisted Spoon Press, 2010). She is an associate professor of English at Bar-Ilan University, a poetry editor at The Ilanot Review, and the host of a literary podcast called Israel in Translation.